"Don't fall down- you might hurt your brain!" Well...erm..yes... Ill give you that, brains are indeed very important... Yet this is probably the most sound dialogue that comes from the daftest most demented rantings in this fantastically bizarre film. If I had to describe it, I would hover over the words "mentally dilapidating fluff". Born from the mysteries of Agatha Christie, but in fact more resonant with the plot of a Enid Blyton book- If of course good ol' Enid was high on drugs....and possibly simultaneously unconscious. We find ourselves thrust into ringmaster Joan Crawford's traveling circus, she romps around the place straight faced and gutsy, parading her 60 something year old frame in mere tights and utterly terrifying amounts of make up and hair spray. Life is tough in the big top however, when some crazed lunatic decides to off the scatty array of circus stars in decidedly ridiculous ways. A tight rope walker is hung with his own tattered rope mid performance, and a woman sawn in half during a very puzzling scene. The most bizarre is when a man gets a pick in the head during a scene where he happens to lean against a wall. Of course the murderer happens to know exactly where in the wall to hack- obviously using some sort of x-ray vision prediction method. Ah...but the show must go on people! Apparently the fact that the stars seem to die all the time makes ticket sales rocket. Could this mean that Joaney herself is a money mad murderer? Well her poor staff seem to think so- cue some dramatics with a decidedly under rated Diana Dors, clearly only here as her gas bill was a tad high that month. Yet what is the most depressing aspect of the film, is that Miss Crawford, the epitome of slogging actress, delivers her lines with such passion that you can clearly see how hard she is trying to salvage the wreck that is this film. Blimey- you only need to watch the film "Mommy dearest" to know that she was a workhorse, and witness masterpieces in the form of "Mildred Pierce" to gape in sorrow at this...abomination. It was about this time in the movie that I thought it couldnt get worse. I mean, it was pretty dire, and pretty unsalvageable.... Oh my....I was so misguided. 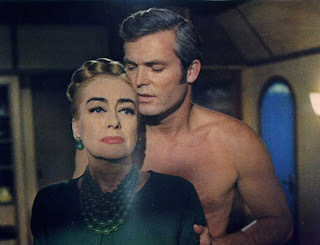 Not only did I have to endure cringeworthy moments with Ty Harden (a good 30 odd years younger than Joan) really trying very hard to act the love interest, but also there was the introduction of the ringmasters random "naughty" daughter, home after being expelled from school. 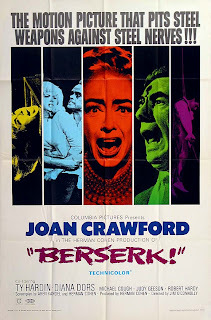 Joan Crawford is: Berserk? You Betya! ....Further research has enlightened me that I was indeed quite sane, and the film did employ the use of dancing poodles and the like. So, with what is clearly a film familiar with the nasty dregs you find at the bottom of tea when you've dunked those oaty treats in too much (yeah- you know what I mean), I REALLY did think there would be a twist, or a reason to cause such uproar in the circus. All I will say is "something" happened. Not a scene. Not dialogue. Something. Something that involves no real reasoning, a few confused circus workers, the final dramatic yelling of the murderer explaining that they simply just like to kill people...oh...and a convienant bolt of lightening. Epically "berserk".